Automate your vehicle comments to create more inventory based leads and opportunities. 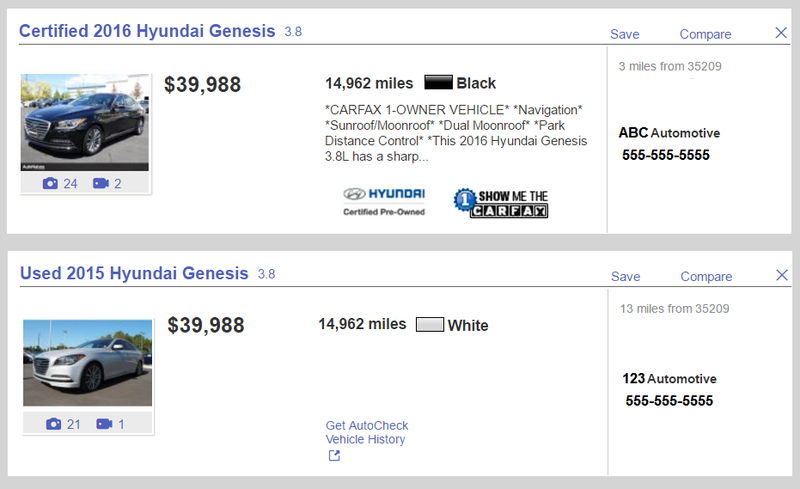 Comments on vehicle listings compel shoppers to click on your vehicle which creates more opportunities for you to sell a car. When you automate the process you can be sure that 100% of your vehicles have a compelling description automatically written for you. Awards the vehicle has won & many more! -New Arrival- Navigation System, Entertainment System, Sunroof / Moonroof, Satellite Radio, and Parking Sensors -Carfax One Owner- This Crystal Black Pearl 2014 Acura MDX Advance/Entertainment Pkg is priced to sell fast! ABC Motors prides itself on value pricing its vehicles and exceeding all customer expectations! The next step? Give us a call to confirm availability and schedule a hassle free test drive! -New Arrival- Navigation System, Leather Seats, Sunroof / Moonroof, Parking Sensors, and Rain Sensing Wipers This Black 2007 BMW 7 Series 750Li is priced to sell fast! ABC Motors prides itself on value pricing its vehicles and exceeding all customer expectations! The next step? Give us a call to confirm availability and schedule a hassle free test drive! -NAVIGATION SYSTEM, HEATED FRONT SEATS, LEATHER SEATS, SUNROOF / MOONROOF, AND PARKING SENSORS- -CARFAX ONE OWNER- -GREAT GAS MILEAGE- -POPULAR COLOR COMBO- This Accord Sdn looks great with a clean Ivory interior and White Orchid Pearl exterior! Save money at the pump knowing this Accord Sdn gets 34 MPG! Please call to confirm that this Accord Sdn is still available! Call us today to schedule a hassle-free test drive! PRICED BELOW MARKET! INTERNET SPECIAL! -CARFAX ONE OWNER- MULTI-POINT INSPECTED! HEATED FRONT SEATS, LEATHER SEATS, SUNROOF / MOONROOF, PARKING SENSORS, AND DVD PLAYER. This 2011 Honda Odyssey EX-L is value priced to sell quickly! It has a great looking Dark Cherry Pearl exterior and a Beige interior! Please call us to confirm availability and to schedule a hassle free test drive. We are located at: 1515 Main Street, Hometown, GA. PREFER TO WRITE YOUR COMMENTS YOURSELF? Our Comments Generator can help! It gives you a quick and easy way to go through and type in custom comments, quick buttons to add comments from templates and create your own custom templates. Best of all…its included at no charge to AutoUplink customers!